Can you remember the time when Blackpool Balloon 710 was included as part of the Fleetwood Transport Festival parade? The year was 2011 and with the tram acquired by the Fleetwood Heritage Leisure Trust it was transported through the town – its last public appearance. 710 had been withdrawn from service in 2007 and remained in its last Blackpool Transport livery during the parade. This livery was the Line 7 Magenta and Yellow Metro Coastlines livery (a version of which was also carried by 713) and the parade of the tram on the back of what was to be a very familiar Scotts low loader in the next few years was certainly an eyeopener. 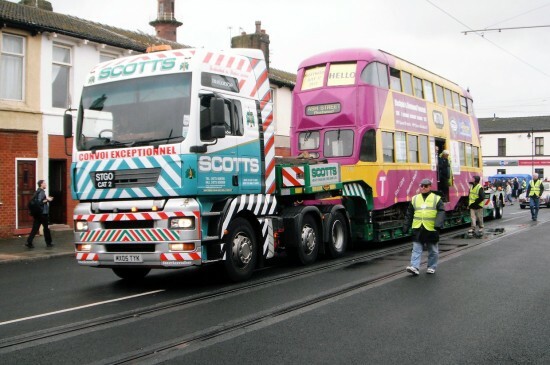 The parade also provided the chance to transport the tram to its new home in Fleetwood ahead of a planned tram museum. To this day 710 remains in Fleetwood with no public access waiting for this attraction to get off the ground. In this photo we see the tram on the back of the aforementioned low loader with special adverts applied publicising the then Friends of Fleetwood Trams (now Fleetwood Heritage Leisure Trust) plus the appropriate Ash Street Fleetwood destination.